What does it take to grow a Christmas tree? Hoe, hoe, hoe, says Crystal Card, a Christmas tree farmer. In other words, a lot of planting, fertilizing, pruning, and watering. "A lot of people think Christmas trees are a yearly crop, but like other forms of agriculture, it's quite time-consuming and work-intensive. 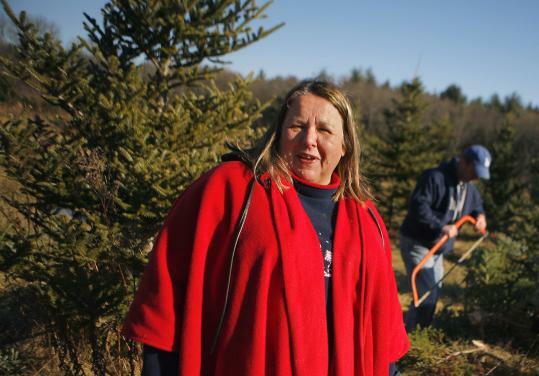 It takes seven years to grow a Christmas tree," says Card, proprietor of GreenWood Tree Farm in Billerica, a family-run operation with more than 12,000 Fraser firs. "One tree sells for $60, and we've never figured out exactly how much it costs to grow that tree, because I think we'd scare ourselves if we saw the expense in man-hours." GreenWood is one of more than 380 tree farms in Massachusetts, with almost 5,000 acres in the state devoted to Christmas tree production, or about $1.8 million worth of holiday joy. On a good weekend, the farm will sell 200 trees a day. Like many other tree farms, GreenWood offers the homegrown experience of cutting down a tree, along with savoring a warm cup of hot chocolate or cider while listening to carols. "It's a happy business to be in, even though we don't get a lot of time to enjoy the season ourselves," says Card, who runs the operation with her partner, Andrew, and two sons, Wes and Glenn. About 1,500 saplings are planted per acre over the farm's eight acres, but the yield depends on the weather. "One year there was no rain, and we didn't have the ability to irrigate, and we lost most of the trees," says Card. "It's quite a process to get them through the first two to three years. A lot of them don't make it." Although artificial tree sales are on the rise, farm-grown tree sales are up as well, and GreenWood, in operation since 1980, has seen tree trends come and go. "In the past we grew balsam and blue spruce, but Fraser fir is the most popular species now, because its branches are strong for holding ornaments and it has excellent needle retention," says Card. "And people used to want a highly sheared tree that is a perfect cone shape, but now they want a naturally grown tree with more dimension." What's the biggest tree you have? Some of our trees are 18 or 20 feet. We sell some really tall ones every year, usually to a company or business. There's a fraternity at MIT that comes every year to get a great big tree, and people with big new homes and a two-story foyer or great room usually like to have a huge tree to accent the window or stairway. Our biggest tree ever sold was 20 or 22 feet. What's the process for growing a Christmas tree? First you need to clear the land and prepare it, which includes removing any stumps and leveling it out. It's important that the planting rows are straight, and you need to mow and maintain between the rows, and fertilize the plants. After about two to three years, you start pruning the plants and making sure that they're not growing out of shape. And you need to keep the deer out, so they don't come in and nibble the plants. What are some tips for someone who wants to select a good tree? Measure your ceiling, and bring a tape measure with you when you come choose a tree. A lot of time the tree won't look as big as it does when you get it home and put it into the living room. The secret to having your tree last a long time is to water it a lot, so buy a tree stand with a big reservoir. Does anyone ever try to return a tree? Once in a while, someone wants to bring a tree back. They'll say that the needles are falling off. But they are trees, and the needles do fall off of them. We'll let them bring the tree back, though. And that unwanted tree will often become the one that we'll use in our home for our own Christmas tree. So it's put to good use. What do you do with trees that don't sell? We need to cut them down, because they'll get misshapen or yellow. Or the tree doesn't grow correctly because of some genetic reason. I'll think, "No one is ever going to buy that tree. We need to cut it down and try again." After they're chopped down, the trees get turned into bark mulch. Can I buy a Christmas tree from you in the off-season? In the summertime, we have some customers who need a tree for a commercial that they're shooting or a movie. Another person recently wanted to come in February and cut down a tree, because her brother was coming home from Iraq and she wanted to have a second Christmas for him. What do you do when you're not growing Christmas trees? I travel to our farm in Louisiana, where we raise queen bees and grow baby beehives to sell to farmers for replacement hives. Do you ever get tired of selling Christmas trees? I need a good recipe for all these pine needles. There are no recipes for balsam quiche.